In January a group from Diocese of Norwich are travelling to the Holy Land, led by Right Reverend Graham James, Bishop of Norwich. 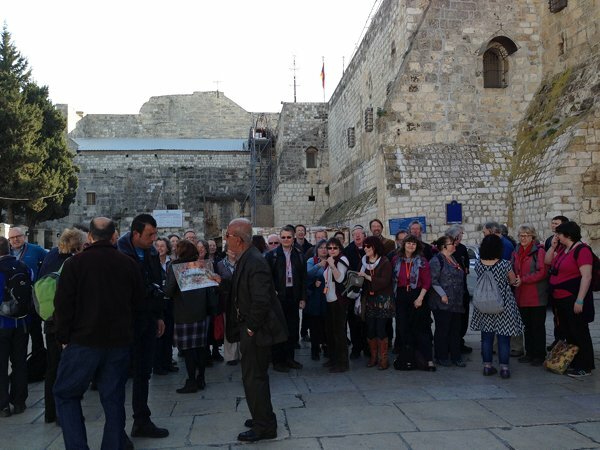 The chance of a lifetime for many and a journey all who want to walk in the places where Jesus walked. 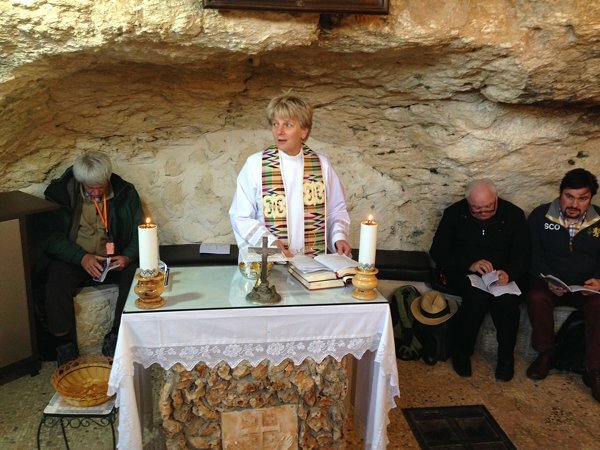 We visit many of the sacred sites but as Bishop Graham said,” We will see them in the context of the present day reality of life in Israel and the Palestinian Territories. 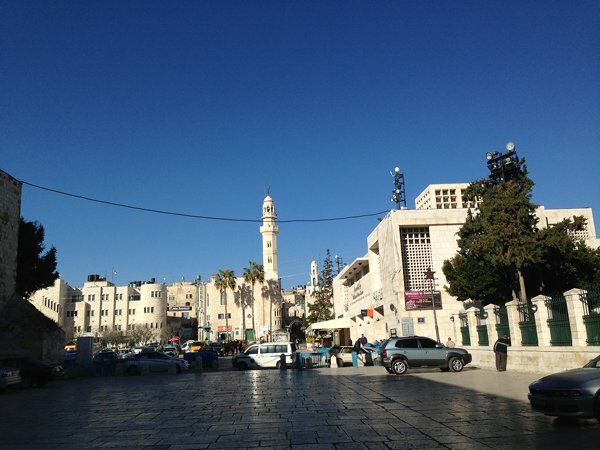 Follow us on this blog, Facebook and Twitter, as we journey to the Holy Land, touching the life of Jesus and experiencing the life of Palestinian’s today. These web pages are part of the Faith Goes Walkabout family of web sites. Designed, produced and edited by the Reverend Sue Martin of the Norwich Diocese. Supporting the work of the Diocese and communities of faith in the East of England. The original call for Pilgrimage from Bishop Graham, quoted below, expressed the context and hope for our visit to the Holy Land. Hoping that we will gain fresh insights into the Christian context of the region, as well as supporting the Christian community whilst we are there. The Pilgrimage is designed to visit the sacred places, but also to engage with the Christian communities in the landscape. Sharing, broadening and growing our own faith and ministry as we travel. “As you know, the number of Christians in the Holy Land has fallen considerably in recent decades. They long for their fellow Christians elsewhere in the world to come not just to the pilgrimage sites but to visit the “living stones” of the Church there now. This visit is designed to do that and I am sure you will receive a great deal which will inform and strengthen your ministry”. We look forward to adding to these web pages to illustrate that ‘spirit of Pilgrimage’ that Bishop Graham has enunciated in his message. Two days to go and thoughts were forming on all that we were about to see and experience. So far books have helped to become more familiar with the places and the time-scales of Jesus ministry. All of which are well recorded and I have enjoyed further reading to help form a visual picture of those travels. If this is your first journey to the Holy Land, then there may be confusions around the images in your mind and the reality of the place in 2014. A day full of wonder and awe the Lake was so peaceful and calm, a boat trip to remember for ever, a Eucharist by the shore of the lake, which was amazingly beautiful.. In temperatures of about 15C we set out in the boat to the middle of the lake. 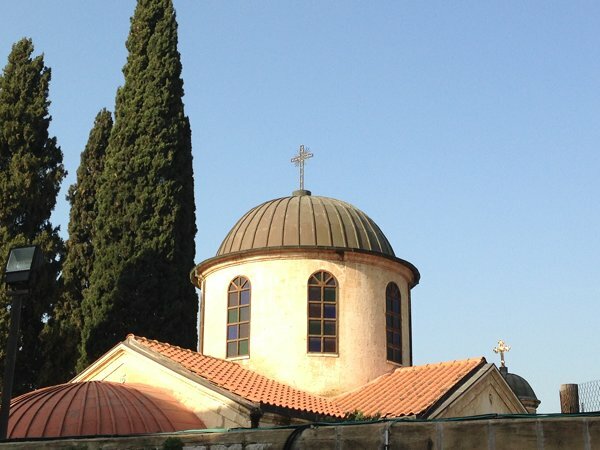 We stopped , in the quiet and calmness, the places that we all knew from the New Testament were shown to us, and we saw across the Lake,the places where Jesus lived and worked, where he carried out the first miracles in Galilee. We saw Magdala, where Mary Magdalene lived, the place where Jesus preached the sermon on the mount, the feeding of the five thousand, Capernaum, the Golan Heights and much more. It was so peaceful, we had a readings, prayers and then dancing! 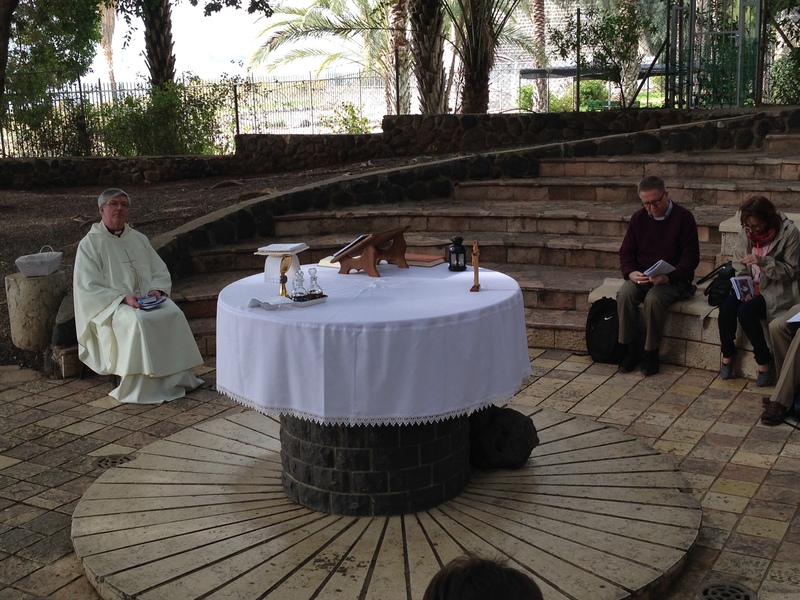 At the place by the shore where Jesus asked Peter to feed his sheep, we had our first Eucharist service in the open air under the trees, close to the Lake. The Gospel reading was Mark 4 :35-41, Bishop Graham preached on the abundance that we are given and the fragments of our lives that are to be used and collected, like the bread that we share. It was truly amazing and deeply spiritual. Along with others I paddled in the Lake, it was clear and warm and was as unlike the North Sea at this time of the year as you could imagine. We saw the stone where it is thought that Jesus stood as he shared breakfast with the disciples. We journeyed on to the place of the feeding of the five thousand and the Mount, where the Beautitudes were taught to the disciples. Lunch was St Peter’s fish at a local restaurant and we enjoyed some time together. After Lunch we were told that changes had been made to the afternoon plan. Syria had dropped some missiles on the Golan Heights, which were in the distance and too close to Caesarea Philippi for us to travel there. The reflection of our first day is amazement and wonder. A beautiful small town, although in Jesus’ time it would have been busier. 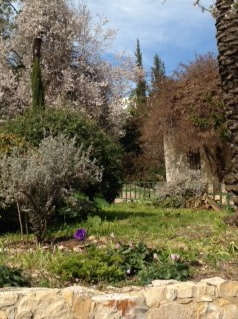 It was where Peter lived with his mother in law, and very close to the synagogue. We saw the remains of the actual room where Jesus would have spent time with Peter. The synagogue was built in 4AD so would have been there in Jesus time, an amazing experience. There are now several built areas around and although well done, I preferred the space to gaze over the Lake, which was calm and quiet, apart from the distant sound of fighter planes and helicopters. Quite surreal. 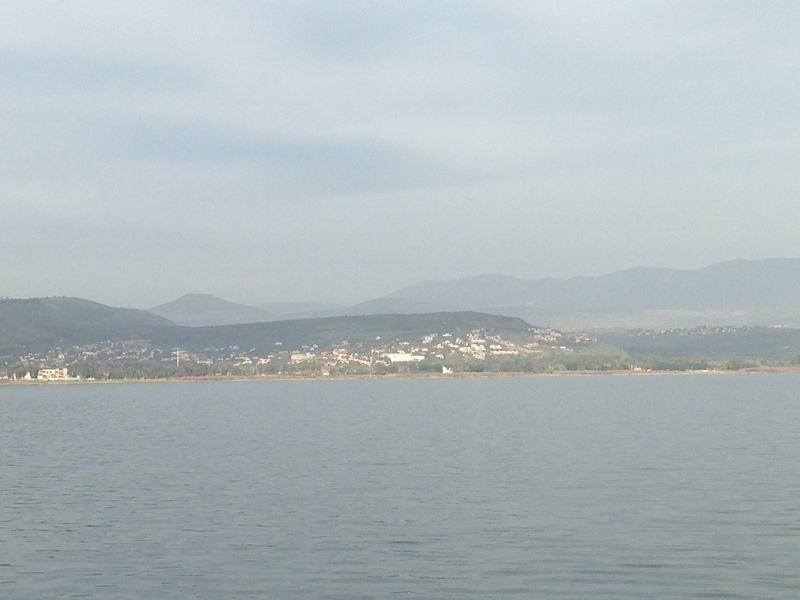 It took us about 30 minutes in the coach to arrive at the site of the baptism of Jesus. The River Jordan, as it leaves the Sea of Galilee towards the Dead Sea, is in a gently sided valley, with trees and grass slope. We sat and watched and we renewed our baptismal vows and watched others immersing themselves in the water. As we sat and watched the river, a flock of birds flew swiftly passed, and followed by a tailing different bird, rapidly trying to catch up with them. At the day’s end we said Evening Prayer, talked a little and shared supper together. Our early morning calls at 6.00am, saw us rising before the dawn, but at least well in time for breakfast and then on to the coach for the start of our journey away from The Sea of Galilee and Tiberius. The view as we left Tiberius was stunning and looking back you could see the harp shape of the Lake. The sun was now well risen at 8.00am above the hills to the west. I wondered if I would ever come back. After an hour we arrived in Cana, and walked in the crocodile formation that for so often I had asked children to walk in. Actually it was quite hard to stay focused on walking in line and the cars which also used the pedestrian path, gave us warning sounds from behind. The small church where the wedding took place was tucked away in the streets of Cana and we waited outside for a while. Inside we saw the very large vessels which were the type of wine jugs where Jesus performed his first miracle of turning the water to wine. Mary, mother of Jesus, had asked Jesus to do something to help as the hosts had run out of wine. Jesus was at first unwilling, but then turned the full jugs of water into wine. If Jesus was about to be a ‘party goer’, this would be an invite forever! It was planned that we should have Eucharist, here, but that was not to be as we were not able to use their vessels, a different type of Christian it seems. We went back to the coach, heading onwards to where we may be able to celebrate the Eucharist. By now the sun was shining and the day lay brilliantly open before us. Mount Tabor, a perfectly shaped mountain arose from the flat plain and looked magnificent in the distance. We climbed up the hill in the coach, which Papa Abraham was driving with his usual care and speed to the parking spaces,where we continued to the summit in smaller vehicles, which took the 180 degree bends at alarming speeds. We were able to buy a coffee as we waited and gazed across the plains, the sky remained blue with clouds gently rolling in the distance. Once at the summit we could see for miles and we walked into the Church of the Transfiguration, which sat above the rocks where Jesus stood with Moses and Elijah. This may be one of the most beautiful churches I have ever been into, I am running out of adjectives to describe the sense of awe and wonder! Underneath the bamboo covers Bishop Alan celebrated, and we shared a welcome Eucharist together. The sound of the wind whistled through the bamboo as it gathered quickly at times and was mixed with the gentle sound of rain as clouds had gathered briefly. 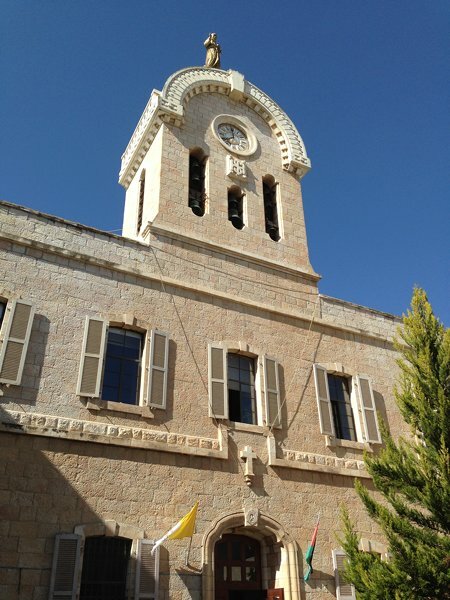 Bishop Alan talked to us about the divinity and humanity of Jesus in this place, the wisdom of his mother Mary to start his ministry, and how he shared this with his disciples, on Mount Tabor. Descending Mount Tabor we journeyed on to Nazareth. 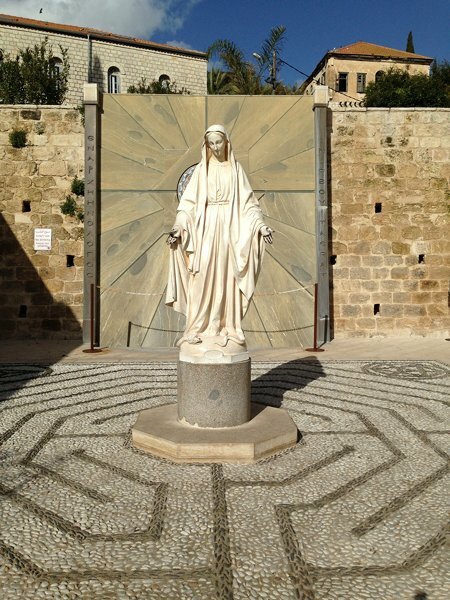 Nazareth in Galilee… could we actually be visiting this special place from the Bible, the place where Jesus grew up with Mary and Joseph. A place, held dear, in my mind. But what would it actually be like? I was surprised how close it was to Mount Tabor and this must have been a favourite view for Jesus in his youth. When we exited the coach and walked towards the centre, there was a very large notice from a Muslim group quoting the Koran and telling us that we were wrong. An indicator that the mix of religions in Nazareth was very evident. 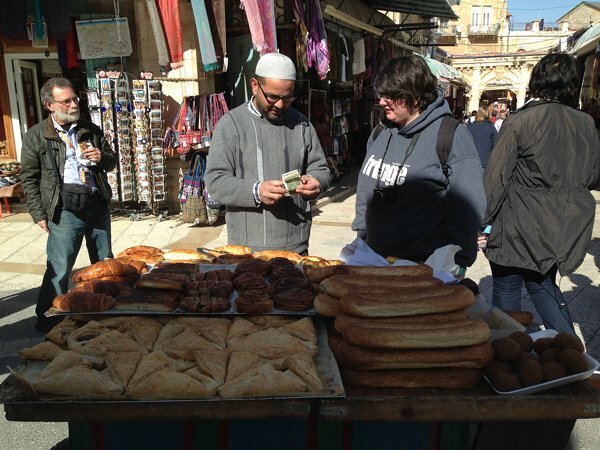 We had some lunch of meat or falafel and pitta bread and a welcome stop before we went to many churches. A little way up the street we came to the Church of the Anunciation, which was the site where Angel Gabriel met with Mary. A wonderful church and on the site also of the house where Mary spent her childhood. We then walked to the Church of St Joseph and talked about the carpenter shop, walked on to the Synagogue church which was where Jesus came as a boy. In complete contrast we visited the Eastern Greek Orthodox church which is built over a stream , from which you can take holy water. As we left Nazareth and journeyed on to Bethlehem, it was a reminder of how far that first journey was for Mary and Joseph and a reminder for me of how different our next few days were going to be. This is a non profit organisation for Palestinian Christians, and we listened to Sami Awad, the executive director. 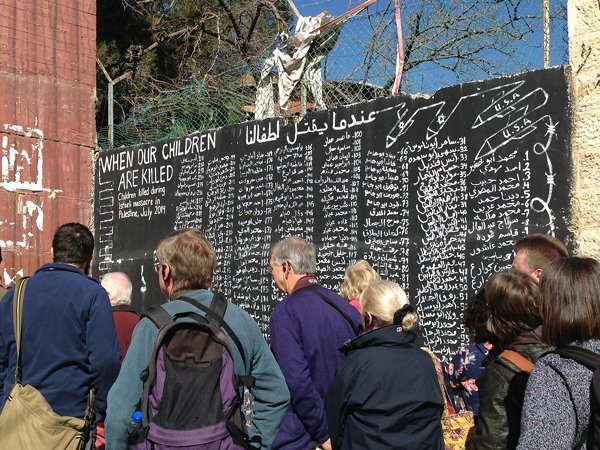 He explained the reasoning for the organisation, the aims and the reality of life in the Palestinian Territories in Bethlehem. 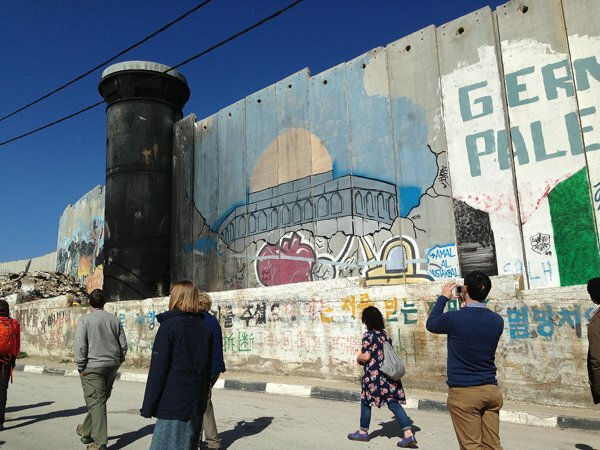 Although we had already seen the wall the previous night as we crossed the checkpoint into Bethlehem, it was an enormous shock to hear about people’s lives, everyday problems from living in an enclave, and deeper problems about non representation. 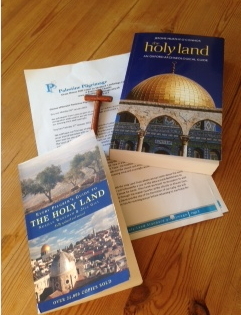 The Holy Land Vision is to achieve a lasting and just peace, and all details are to be found on their website; www.holylandtrust.org. This blog is not the place to go further and there is little time to write all that I would like to about all that we heard in that hour. A quote from Sami,” My grandmother on my father’s side was the greatest person in my life. She lost everything, her husband, her sons and family…’ but she said,” …as a family, we will not seek revenge, we will seek reconciliation.” And there the seed was planted. We went to the Aida camp and Marwan gave a passionate description of life there, on the inner side of the wall. The photos give a clear picture of the scene. And as we stood and listened, a small girl came and brought bags of rubbish at the site near the wall. Perhaps the most poignant was the small boy, aged about three or four in his ‘wellies’, who just wandered in and out of the skips, looking for something to play with and then found some old planks with nails in. Maybe I shall never forget the sight of the bullet holes in the upper storeys of the flat. The drawn curtains as they were considered to be too close to the wall and were not able to look over the other side. On a section of the wall there were the names of lost children from the battle in July 2014, last yea. A stark reminder of the injustice that is happening. At times people cannot get through the checkpoint, they cannot find work so easily and …… maybe an article when I’m home will follow. It’s not easy to put in words the stark reality and mood in this place. 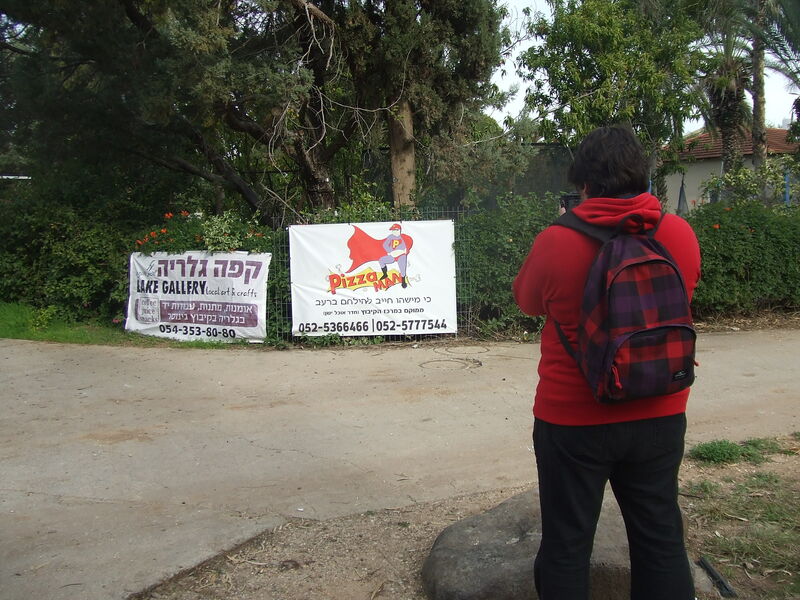 We traveled to Jerusalem on the coach, through the checkpoint and a mile along the road. 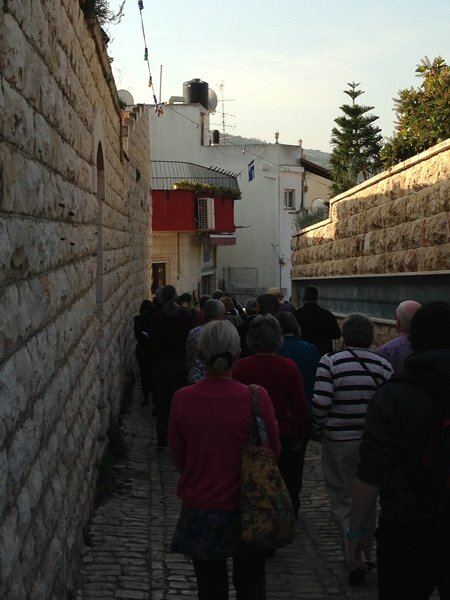 We walked into the Jewish quarter to King David’s tomb. 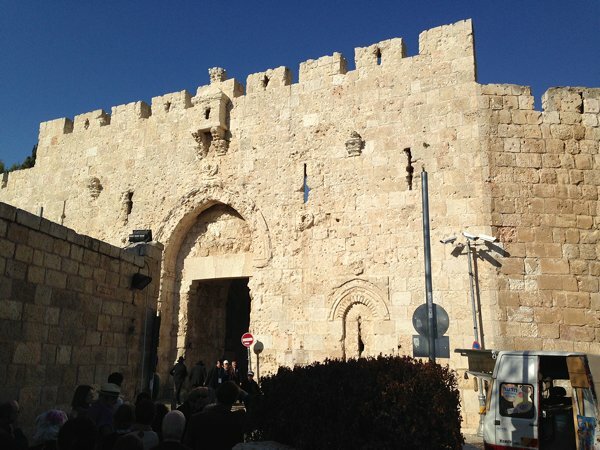 Women and men had separate entrances and this was our first venture into Jerusalem. For the women there was just a small room and an elaborate black velvet and gold cover over the ancient tomb. The walk through Jerusalem to the Western Wall, the remains of the temple, was intriguing, small and beautiful narrow streets with open squares. But at every turn there were young soldiers, walking to the square. We learnt later that they were going to a ceremony that evening. Quite why they all needed a Kalashnikov was not for me to question? At the wall, again we were segregated and I found women, faces to the wall, chanting and swaying in deep prayer. The men also were praying and wailing, and then dancing too. 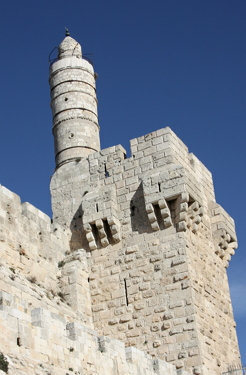 As Jerusalem had been largely destroyed the Upper Room as we saw it was on the site of the Upper Room where the Last Supper was held, and you did have a sense of the supper and the room for sanctuary and safety for the disciples after the crucifixion. Further on we came across the site where it is believed that Mary was found asleep and died. She had asked to be placed in the same town where her son died. This was an amazing end to an incredible day. 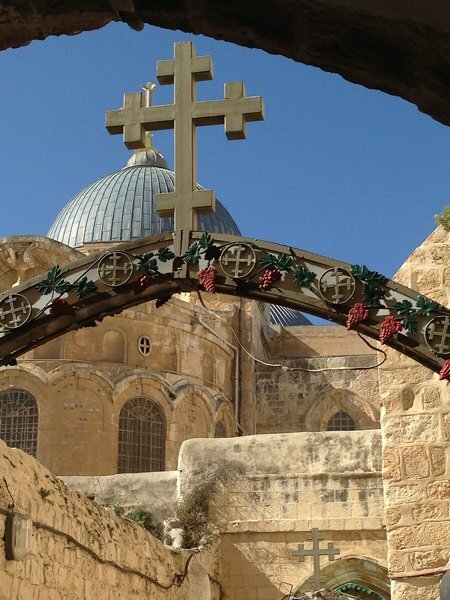 Father Johnny explained how hard life was for the 2% of Christians that lived in Jerusalem. The hospitality in this place was very warm and deeply thoughtful. We were invited to Evening Prayer where Bishop Graham led us all in worship. 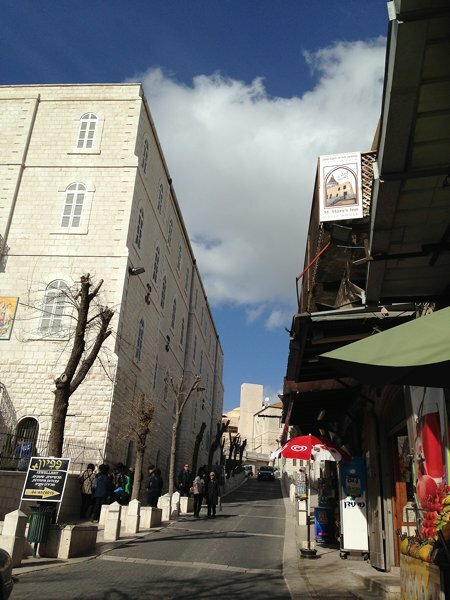 Our hotel was a short walk from Manger Square, Bethlehem and was called Manger Square Hotel! At 8.30 we gathered and walked to the square, before the crowds arrived. It was very cold and we entered the Church of the Nativity through the tiny door and escaped the cold wind. Inside the church was reminiscent of some of our home churches, there was scaffolding everywhere and as they are not able to close the church, the building work carried on. 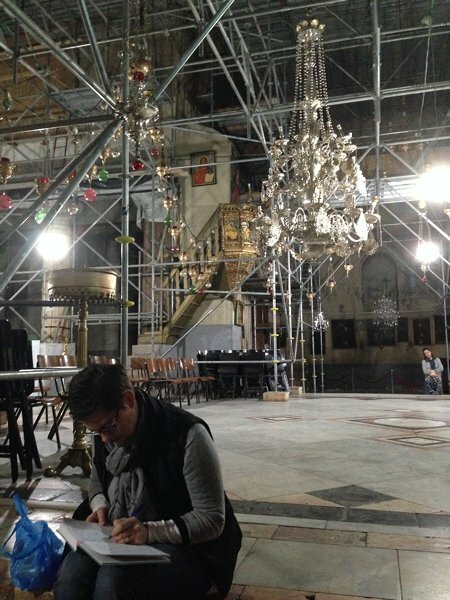 Interestingly, they still had the most magnificent chandeliers amongst the scaffolding. We waited in a line, for 30 minutes, often being told to stay quiet! We went down the tiny steps to the place where the star marks the place which is thought to be the place of the nativity. And there we met Father Johnny, who was at the seminary last night, he and some students were holding a service. It was an emotional place, although for some, the presence of so many thurifers and icons was confusing with the simplicity of a stable or cave. In the square we made our way to the Church of St Catherine, a relatively recent Roman Catholic beautiful church with caves where it is thought the remains of the children who were killed by Herod were placed. 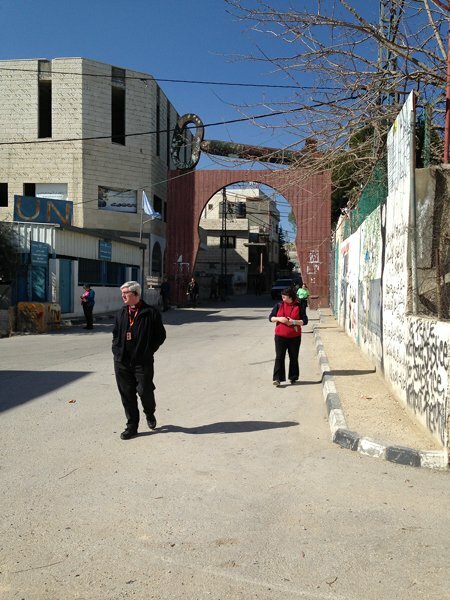 Back on the coach for a short trip, we entered the Bethlehem University Campus. We entered the grounds and the gates were closed behind us. The university was established in 1973, on the site of the secondary school. We met in the chapel, which is dedicated to the street boys of Paris,above the altar and outside at the top of the tallest building is a statue of the boy Jesus. We were welcomed by staff and students, 10 students gathered and animatedly told us of their lives, their studies and their hopes and dreams. It was such a good experience and we listened in shock as they described how hard it is for them to be able to study and live a daily life at the university, in the Palestinian Territory of the West Bank. But their spirits were high and they are all actively working to their finals or Masters, with hopes to travel and to become employed. There are many more girls than boy students and some of the reasons for are that boys can travel and study abroad, which is very hard for girls to do. Many boys also need to firstly take care of their families and do not have time or money to study. They made a strong impression on us all and as we were leaving, one of the girls climbed on to the coach to tell us they were delighted to have met us. I think she was also on the way to the basketball court, her passion is to be a basketball player, maybe in the USA. How we hoped that she achieves this. After lunch we went to the site of the Shepherd’s Fields and you only had to imagine the sheep and the shepherds. We went into the caves where they would have sought shelter. As we stood and gazed to the other side of the valley, we saw a new settlement that had been built on the hillside for the Israelis settlers, behind high security fences. We celebrated Eucharist and sang O Little Town of Bethlehem and O Come All Ye Faithful, enthusiastically, as we celebrated on that special day. 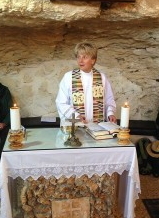 The Very Reverend Jane Hedges celebrated Eucharist and gave the address, in the space of the cave and we all managed to find a space to sit somewhere nestling into the cave. The address was about sheep and shepherds, and that as we go back into our communities we can be as that good shepherd. Gazing across the valley towards Jerusalem, it was possible to imagine the Angel Gabriel on that bright starry night appearing to the shepherds. At the door of the hotel the bag-seller met me as I stepped out to see the glorious sunshine and feel the fresh air. And no, I didn’t want to buy a bag for any price really. I said to him that I just wanted to be out in the sunshine in Bethlehem. And so started our conversation about Bethlehem! Mahmoud is a Palestinian Muslim,with perfect English. 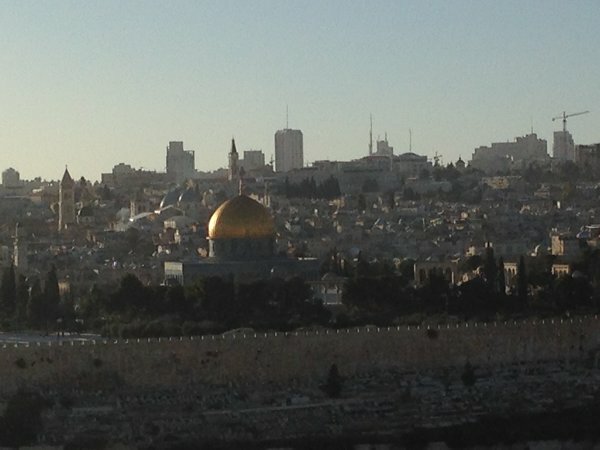 He had not been allowed to go to Jerusalem in 20 years, he was unable to find a job, this was his home and he pointed out on the skyline the buildings of the University, a church, and a mosque. I said I would return tomorrow and carried on down the street, getting some fresh air and a chance to spend some time on my own before the start of the day. The day that lay open before us was going to be one to be cherished. 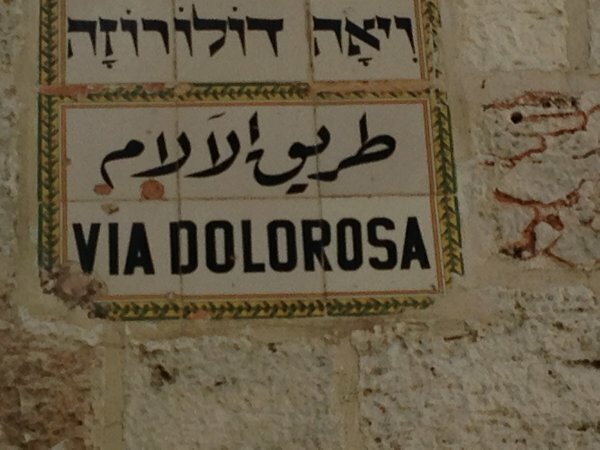 Following in the footsteps of Jesus along the Via Delarosa and marking the Stations of the Cross. Below is just a snap shot of this journey. We entered through St Stephens Gate, visited to the Pools of Bethseda and the Church of the Paralytic, with a reading from John 5. 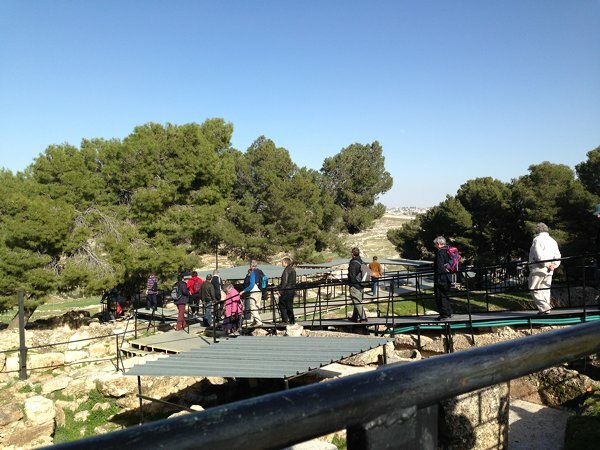 This was the place where Jesus was taken from Caiaphas to the Praetorium. We walked along the Via Delarosa and stopped at the Stations of the Cross, where Bishop Graham read a short passage from the Bible and followed with prayer. There is a complex history to this place and many Christians have different ways of marking this holy place. I did not wish to take photos inside the church as we visited the tomb, the anointing stone and the tomb of Joseph of Arimathea. A splendid lunch of pizza, or falafel and Shirwama, time for a little shopping and even a dessert of sweet pastries on mobile cart, or as we would call it now a ‘pop up shop’, beautiful. 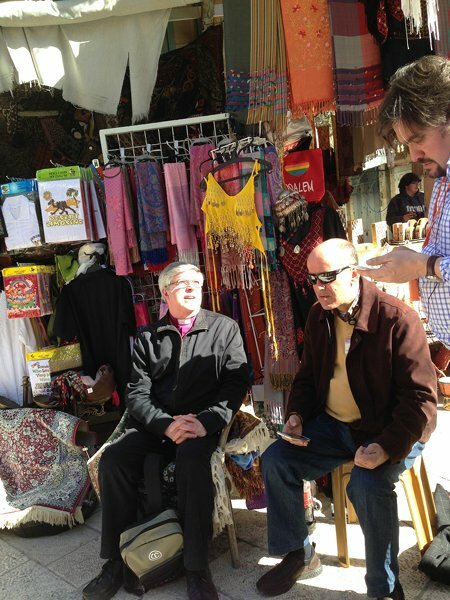 Bishop Graham also joined in the street scene and with Anise, our guide had a welcome seat from the shopkeeper. 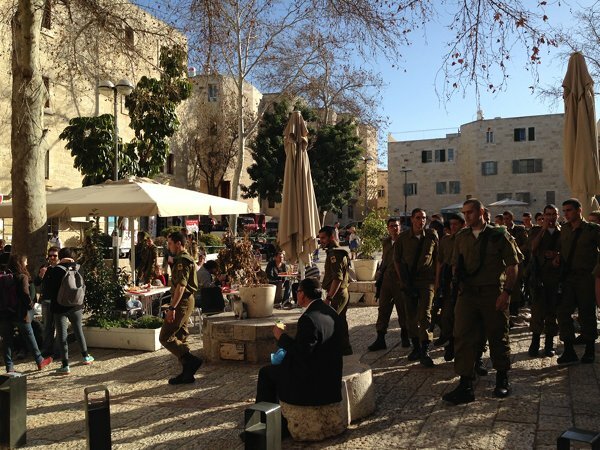 Before arriving here we had tried to go to the Mount of Olives, but the police were not allowing this today. The Church of All Nations was our next visit and as we rested after visiting it we could see the view of the walls of Jerusalem across the Kidron Valley. We heard of the importance of the olives to Palestinians and the economic value of each tree of $ 200 per annum. In building the separation wall, 75,000 trees have been lost. Our final stop for the day and the Dean started her journey to Jerusalem on a camel, a remarkable picture and fortunately the camel owner gave her time to rejoin us going down the steps. At Dominus Flevit we sat for a while in wonder at the sight of Jerusalem in front of us as the sun went down. It was a chance for us all to recap on the day and to think again of the journey of Christ as he made his way to Golgotha. The end of a day, yet another one to remember in true vividness and to hold in your heart. 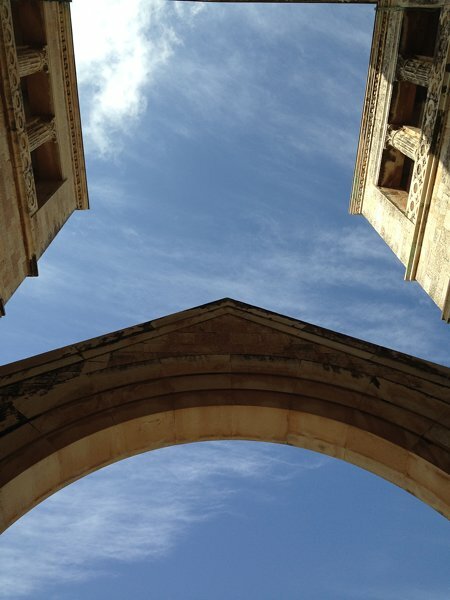 The sunshine was still with us and as we arrived at St George’s Cathedral, the warmth was very welcome. Inside the church, we all felt very much at home in the Anglican tradition and style in the cathedral. The service sheets led with an introduction from The Right Reverend Suheil Dewani, Bishop of the Episcope and the Diocese of Jerusalem which covers many countries as well as the city. “ All Christians must come here first as pilgrims – pilgrims here do not bring decisions with them. They come here to seek prayerfully the decisions God wants them to make. And God will always surprise us. God has not finished with our church or with us yet. In the afternoon we had free time and I relished the thought of going into Manger Square. But before that I needed to see Mahmoud. 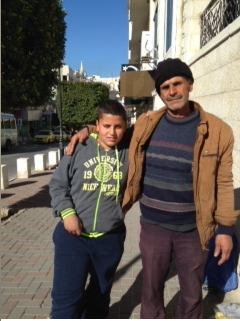 He was sitting on the street with his son, Ahdouf, I did indeed buy some bags at a good price! But bargaining is not my speciality and this didn’t seem right. 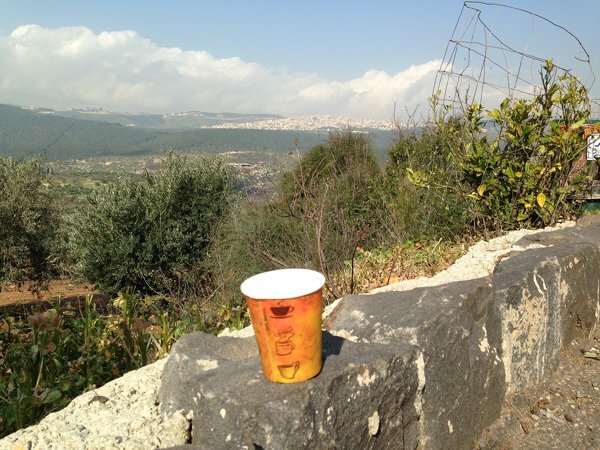 Along with 2 other pilgrims, Mahmoud treated us to coffee and a talk about life in Bethlehem. God of our pilgrimage,You kept Abraham and Sarah in safety on their journey.You led the children of Israel through the midst of the sea, And by a star you led the Wise Men to the infant Jesus.Protect and guide us as we travel through your Holy Land, And follow the footsteps of your Son, Jesus Christ. Bring us into the presence of your Son, Who is the Way, the Truth and the LifeThat we may follow your paths of justice and peace, And find your everlasting joy. 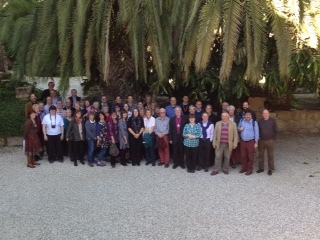 At the end of our journey, we gathered outside the Church of the Resurrection for a final picture. This is a peaceful place and the grounds of the Benedictine monastery has been there for about 1000 years. 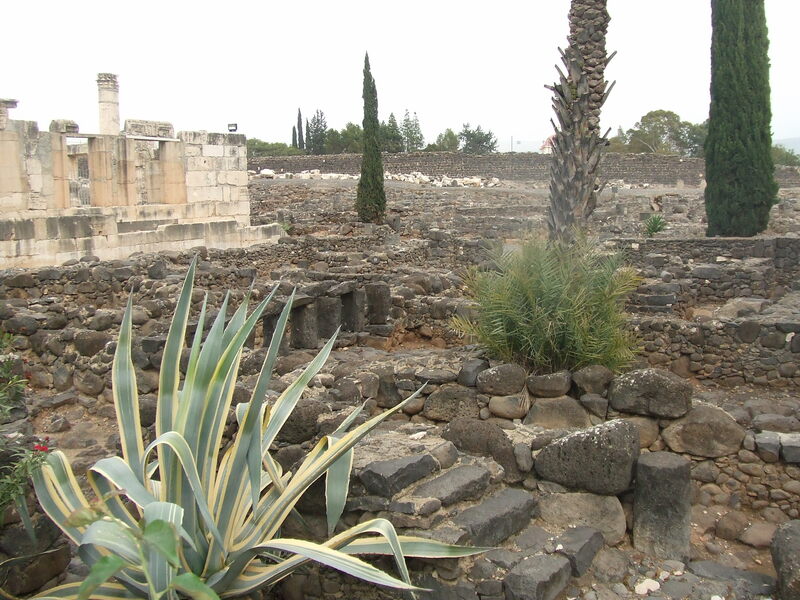 Abu Gosh is Emmaus, the place where Jesus revealed himself to his disciples after he was resurrected. We were at the end of our pilgrimage and this was a good place to leave the Holy Land. 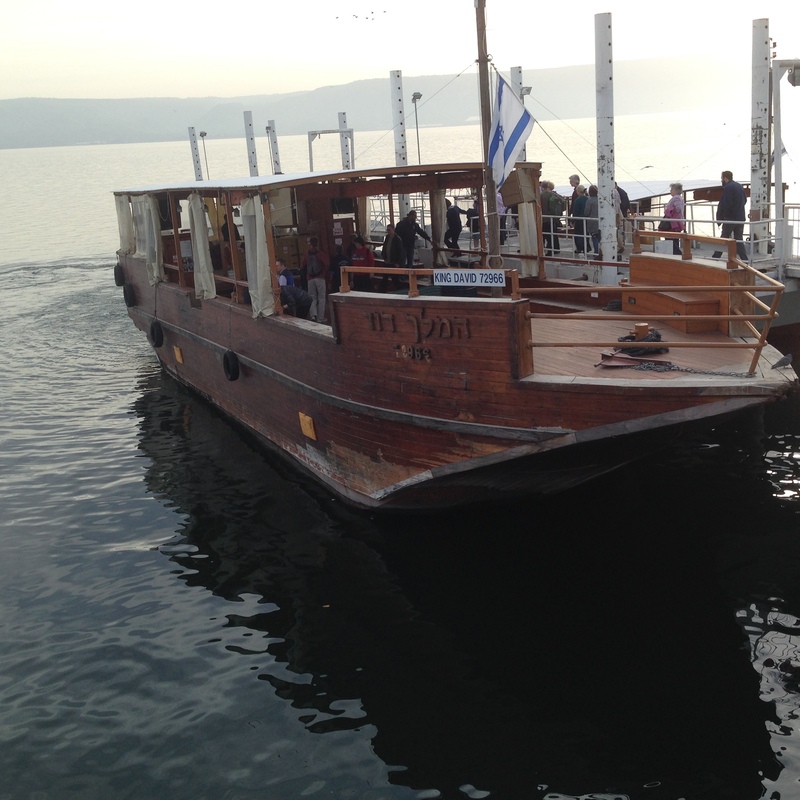 At the start of our journey we gathered at the Sea of Galilee, where Jesus began his ministry, where he called his disciples. 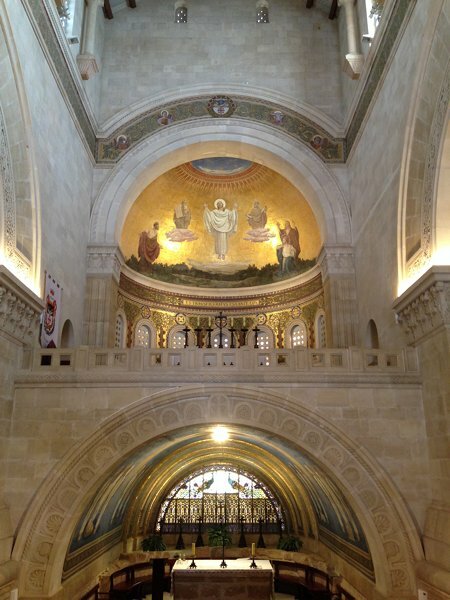 We journeyed to and through Nazareth and Bethlehem, we stopped for several days in Jerusalem and experienced the sites of the crucifixion and the places where Jesus entered and walked in the old city of Jerusalem. 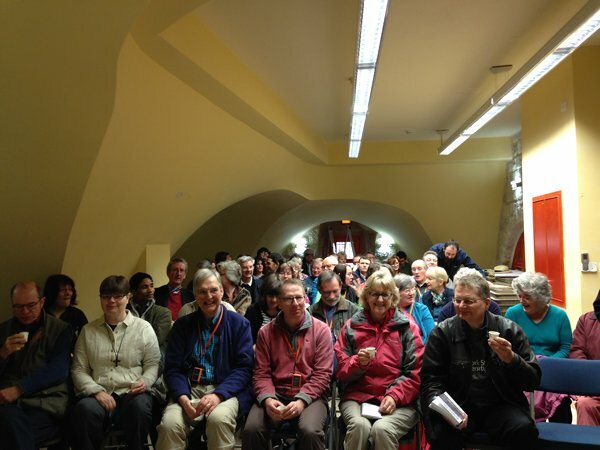 We did much more than just visit, but then is that not what a pilgrimage is all about…. a journey of discovery, a time for God to find us and to enable us, with guided and prayerful direction, as we journey back home and then onwards from there. God of our pilgrimage,You kept Abraham and Sarah in safety on their journey.You led the children of Israel through the midst of the sea, And by a star you led the Wise Men to the infant Jesus.Protect and guide us as we travel through your Holy Land, And follow the footsteps of your Son, Jesus Christ. Bring us into the presence of your Son, Who is the Way, the Truth and the Life,that we may follow your paths of justice and peace, And find your everlasting joy. 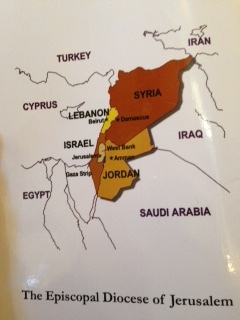 See the 'pdf' book of our travel to the Holy Land in 2015 - 26pp. (updated July 2015). Find our Diocese on Facebook here…be part of our story!